Nestled on the beach, this Paje hotel is 0.1 mi (0.1 km) from Paje Beach and 2.2 mi (3.6 km) from Jambiani Beach. Kuza Cave is 3.5 mi (5.6 km) away. 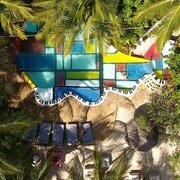 Nestled on the beach, this Paje hotel is within a 15-minute walk of Paje Beach and Jambiani Beach. Kuza Cave is 2 mi (3.2 km) away. 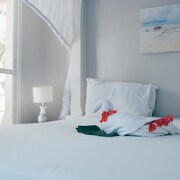 Situated in Paje, this hotel is within a 10-minute walk of Paje Beach and Jambiani Beach. Kuza Cave is 1.8 mi (2.9 km) away. Nestled on the beach, this Paje aparthotel is 0.1 mi (0.1 km) from Paje Beach and 1.9 mi (3 km) from Jambiani Beach. Kuza Cave is 3.3 mi (5.3 km) away. Situated by the ocean, this hotel is 0.1 mi (0.1 km) from Paje Beach and 2.1 mi (3.4 km) from Jambiani Beach. Kuza Cave is 3.4 mi (5.4 km) away. Nestled on the beach, this Paje guesthouse is within a 10-minute walk of Paje Beach and Jambiani Beach. Kuza Cave is 1.8 mi (2.9 km) away. Nestled on the beach, this Paje hotel is 0.1 mi (0.1 km) from Paje Beach and 1.7 mi (2.8 km) from Jambiani Beach. Kuza Cave is 3.1 mi (5 km) away. Nestled on the beach, this Paje hotel is 0.1 mi (0.1 km) from Paje Beach and 2.4 mi (3.8 km) from Jambiani Beach. Kuza Cave is 3.6 mi (5.9 km) away. Situated by the ocean, this hotel is 0.1 mi (0.1 km) from Paje Beach and 1.7 mi (2.7 km) from Jambiani Beach. Kuza Cave is 3.1 mi (5 km) away. We loved the villa! It was laidd out well and the rooms were beautiful. The air conditioner did not work in one room, which made it rough, but the property provided a fan. A pool is shared with only 2 villas, so it was like we had our own pool. Plenty of sun chairs were provided and were very comfortable. The dining was about 800m down the beach and at night we were escorted by workers from the property. There were multiple food options at the dining hall. The staff was amazing and extremely helpful and caring. Where to find Paje hotels near an airport? 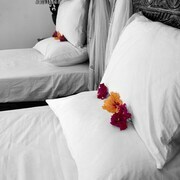 How can I find hotels in different Paje neighborhoods? Where can I find hotels in Paje that are near tourist attractions? If you're searching for upscale or budget lodging options in Paje, it's comforting to know that there's a myriad of suitable possibilities. Our database features 37 accommodation options within a 0.1-kilometre (0.06-mile) radius of Paje's heart. Travelers searching for accommodations near the heart of Paje, can choose from the Zanzibar White Sand Luxury Villas & Spa and Cristal Resort. Our extensive database offers just a small selection of economical accommodations in Paje. 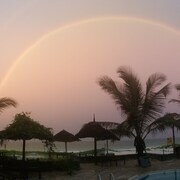 The Ndame Beach Lodge is one of them. 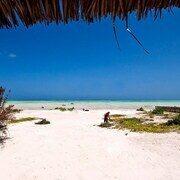 The The Residence Zanzibar is 17 kilometres (11 miles) away from downtown Paje. Another alternative is the Kono Kono Beach Resort, which is located 17 kilometres (10 miles) away. 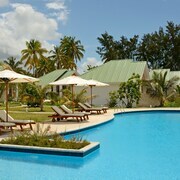 The Anna of Zanzibar - All Inclusive and the Breezes Beach Club & Spa are two other Expedia-listed accommodations in Paje. 40 kilometres (25 miles) from Paje is Stone Town, where you can explore Darajani Market and Beit el-Sahel. Some of our recommended Stone Town hotels and accommodations include the Zanzibar Serena Hotel and Mashariki Palace Hotel. 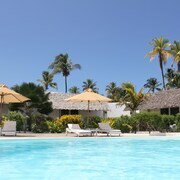 Or, you could consider staying in Nungwi, 65 kilometres (40 miles) to the northwest of Paje, where you'll find the Diamonds Star of the East Zanzibar - All Inclusive and Essque Zalu Zanzibar. The Nungwi Beach and Mnarani Natural Aquarium are just a couple of the more popular places to experience when you're in Nungwi. Before your Paje trip draws to a close, why not spend an afternoon rubbing shoulders with Zanzibar sports enthusiasts at a local sporting fixture. You'll find Tanzania National Stadium 70 kilometres (44 miles) to the southwest of Paje. Those sports fans wishing to stay near to the action can make a choice from the Hyatt Regency Dar Es Salaam, The Kilimanjaro or the Dar Es Salaam Serena Hotel. 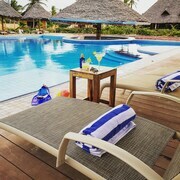 If you are traveling into or out of Zanzibar International Airport and would like to stay nearby try Protea Hotel by Marriott Zanzibar Mbweni Ruins or Zanzibar Beach Resort. 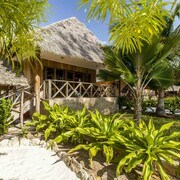 What are the most popular Paje hotels? Are there hotels in other cities near Paje? What other types of accommodations are available in Paje? Explore Paje with Expedia.ca’s Travel Guides to find the best flights, cars, holiday packages and more!